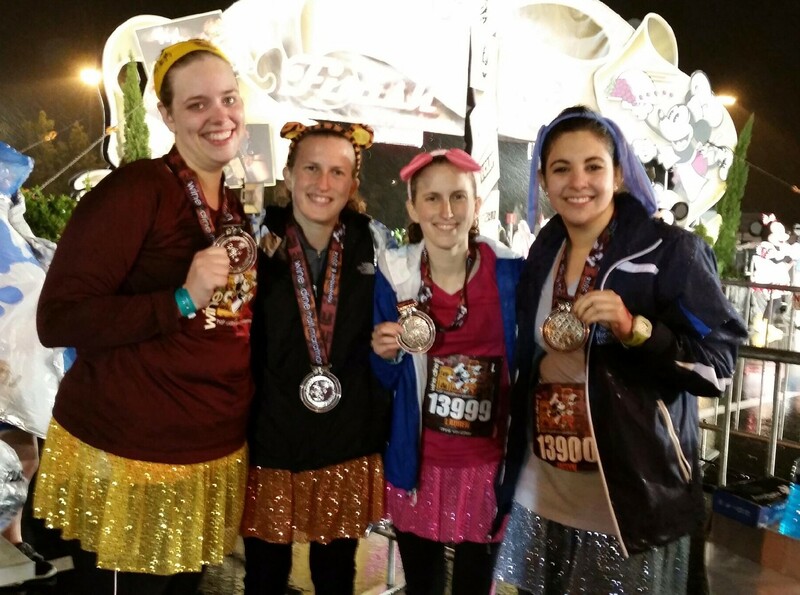 The Wine and Dine Half Marathon – 5 Years Running. PHEW. I’m only a few days into my mega-Florida trip and I’m already exhausted. It’s probably due to the lack of sleep I got from participating in Disney’s Wine and Dine half marathon – starting at 10pm on a cold rainy night. Of course, I was nervous for the race, but I was especially nervous because my training had fallen a little flat towards the end. Between #heweb14 and then getting sick a week before, I hadn’t really gotten my body back up to speed. I had to continue to remind myself that I had completed a half marathon in Buffalo before, and that this would be a test of my mental strength alongside my physical strength. But, in the end, it’s about the experience – being with my friends, running through the Disney theme parks, meeting characters, and getting an AWESOME medal to show off my hard work. The weekend adventure began the day before the race with the runners’ expo and Pre-Race Taste. We headed to the expo in the late afternoon, and then it all started to feel a little more real. I had already been in Disney for about a day, but walking in and seeing the signs, photo spots, merchandise, and other racers in the ESPN Wide World of Sports really sealed the deal. First stop was to pick up our packets, which included all the information we needed for the weekend. It was overwhelming, to say the least. Then, we walked around the expo, which was filled with people selling a crazy amount of Disney themed running gear, gels, food, bandages…anything you could think of. Everything was drastically over priced, but I like to see what’s out there. We then headed over to Hollywood Studios, where the Pre-Race Taste was going to be held later that night. We didn’t have too much time, but managed to squeeze in a few things before the event. The Pre-Race Taste was held right on the set of Lights, Motors, Action!, one of my favorite shows in Disney. We walked in to a French themed party, with a live band playing, mimes who talked and joked with us as we ate, and characters, of course! We hopped in line to meet Remy and Emile from Ratatouille, and Belle and the Beast came by, too. Naturally, the food fit the decor and character visitors, which was delicious as well. After helping ourselves to as much food as we wanted, then sipping down the signature drink, we headed back out into the park and re-visited the Osborne Lights – the only reason I would come back to Disney during the Christmas season. I like to run in the morning, especially my longer runs. I get it out of the way and feel good all day about the healthy choice I made that morning (cut to Jackie eating a pint of ice cream alone that night). 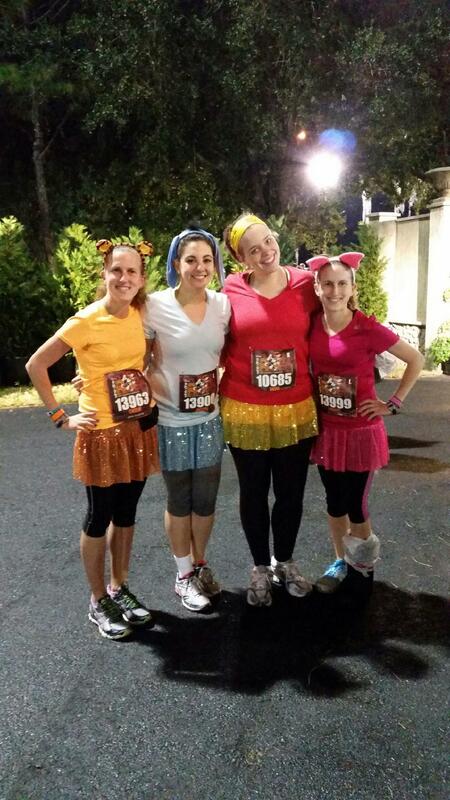 The Wine and Dine half, though, was at 10pm. I had no idea how to prepare for it. We had a full day of eating and park-walking planned, but yet still had to manage to prep for a half marathon late at night. I was concerned about what to eat, when to sit down, and how to prep immediately before the race. We worked out a good plan, and stuck to it. The morning of the race, we had a decent breakfast at our hotel. Mine was filled with protein – a huge western omelette. Solid decision there. We filled up our water bottles, then headed off to Epcot to adventure for the day. Epcot has always been my favorite park growing up, and I’m always excited to go back and see everything that holds all those childhood memories. The weather in the morning was perfect. Sun was shining, but not oppressively hot. My favorite kind of weather, and not usually the weather that Florida greets me with. We cautiously watched the forecast for the day, as it showed increasing chances of rain that night, starting just around 10pm. Now, of course, I became more stressed out about the race. 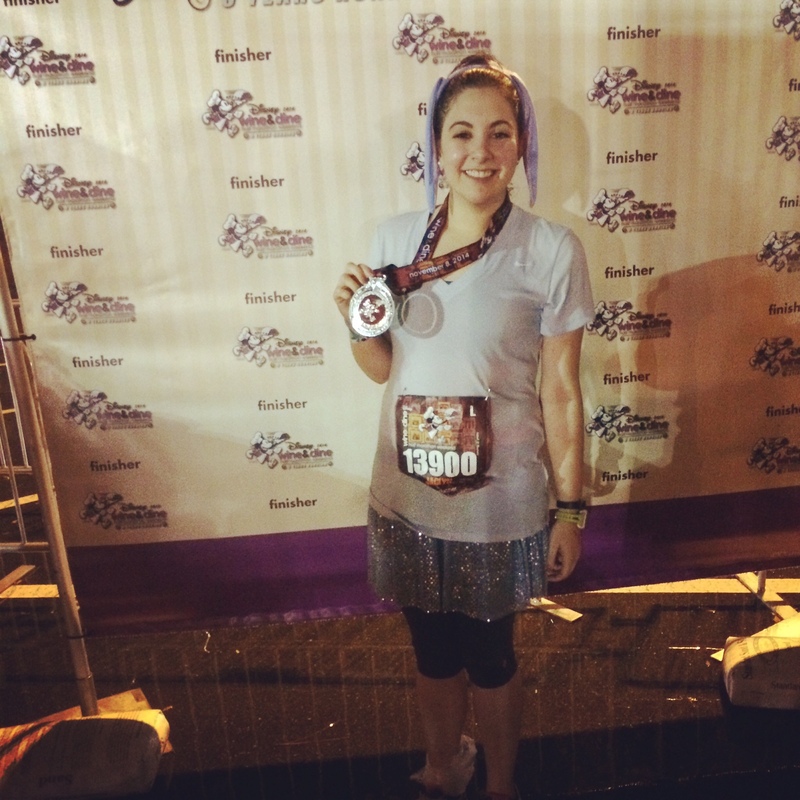 I had no idea what to wear, as I had never run in the rain…let alone 13.1 miles in the rain. I knew it would be a little warmer outside than upstate NY’s rainy nights would be, but how do I prepare to run in dripping wet clothes, plus my costume? My mind was racing all day. We tried to squeeze in as much of Epcot as we could before our 2:00 reservation for lunch..or maybe dinner…I’m not sure what it was anymore. We had access to the cuisine of 13 countries, but chose Italy for its carbs. Still nervous about how to properly eat for a 10pm half marathon, I chose salmon and helped myself to the bread and olive oil on the table. This was our final large meal for the day, so I had to make it count. We eventually headed back to rest our legs from walking all day, greatly anticipating the night ahead. We got ready for the race, trying to pack our bags in preparation for the predicted rainstorm later that night. All of a sudden, we were dressed and ready to head to the start line, snacking on some power bars as we approached. The events at the start line were unsurprisingly hectic. Between bag checking our backpacks, using the bathroom, and simply the number of people at the event, it was hard to stay focused. Some of the characters were there to see us off, and in the true Disney spirit, we spent a lot of time waiting in line to see them. We headed to our respective corrals, mine being the last one because I did not submit any proof of time. I didn’t mind being in the back, aside from standing in the pouring rain for 40 minutes after the official start of the race instead of running in it. Oh well, I would have been drenched either way. Each corral was welcomed as energetically as the one before it, with fireworks signifying the official start of the race for each corral. We were off and running, and I was still in shock I was actually there. Naturally, I was running on a slightly injured ankle, but as I so often do, I chose to pretend that it wasn’t hurting and run on it. More on that later. The course was mostly us running on the street, which isn’t crazy surprising. because we needed a way to get to each park. We headed through Animal Kingdom first, making the course drastically narrow. Being in the last corral, I was mixed amongst the walkers and run/walkers, making it tough to navigate the park. I guess in the end it helped, because my slow jog/walk probably helped my endurance overall. My ankle continued to send me subtle reminders that it was hurting, but I pushed on. 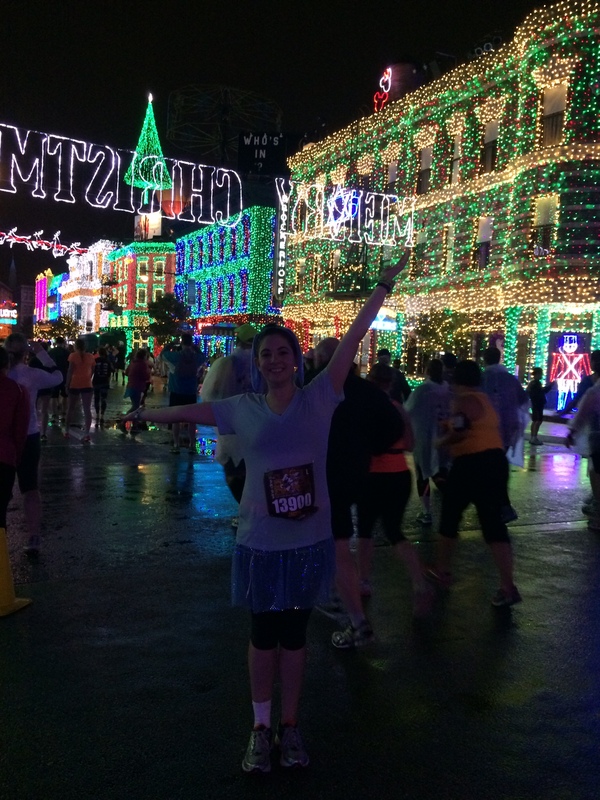 After running on the road for a long time, we made it to Hollywood studios, where we eventually ran back through the Osborne Lights. I was excited to see them again, as well as the rest of the park. A lot of times, we were running backstage, and saw a lot of storage units, and where the extra “stuff” sits. I was suddenly at the 9th mile without realizing how quick it had gone. I was still soaked, my ankle was hurting a little more, and so at mile 10 I forced myself to walk the full mile, no matter how much I hated losing some time. I had to remind myself that this wasn’t for time – it was about the experience. The wet, rainy, dark experience. As I started walking, my ankle hurt more than it ever had, even when I was in a run. I forced myself to push on, and stopped at the medical tent on the course to grab some tylenol in hopes that it would help. Mile 11 had come, and I had two left to run. There’s always something odd about the final two miles of a long run. It feels so far away, but after training for so long, it doesn’t sound like much at all. I picked back up into a slow jog to get my ankle back in the game, and kept telling myself to push through. I had made it to Epcot, the final park and location of the finish line. It was great to see the supporters cheering us on and holding signs, even though it was worse for them to stand in the rain than for us to run in it. I had checked my watch, and I suddenly had less than a mile left. Naturally, this warranted a point of reflection for me and how far I’ve come. Even though I hit many more frustrating points during my training this time around than last time, I was still up, running in the rain, and about to cross the finish line. After it was all over, I realized how cold I was. nothing was dry, my hands were prunes, and I was juggling food, water, a protective blanket, my checked bag, and my phone all while trying to figure out where everyone was and who had already finished. I headed straight to the medical tent to get ice on my ankle. After photos and eating whatever we could find, we were supposed to head to the after party, held in Epcot’s world showcase. We were cold, wet, and tired, so we opted to head home instead. Of course, I woke up the next day with a swollen ankle, but I also had some awesome swag to represent my achievement. Would I do it again? Of course. Would I recommend it to someone to do? Yes, especially as a first-time half marathoner. Would I want to do it again in the rain? No thank you. It was clear that Disney had the intention of endless entertainment as we navigated 13.1 miles, but the rain canceled many of the plans. There were abandoned photo spots and large stretches that had no music, much lighting, or really anything going on. I’m not too upset, because, well, it’s Disney after all, but wish I could have seen the event in full swing. I was impressed with the number of characters and activities that were around, though, because standing in the rain for nearly five hours is not fun at all. The volunteers were amazing, standing in the rain giving us water, Powerade, Tylenol, and overall encouragement as we pushed through. I’ve realized more and more that running, for me, is about the experience and not time or records. I’d love to continue running to be able to travel the country, have new fun experiences, and use them as another reason to be with good friends. Where will the next adventure be? Who knows! Congratulations. Awesome recap. I have been so tempted to do this and now I am even more tempted. Way to push through that rain. I saw that there was threat of severe weather!